This 150 watt LED fixture provides operators with a powerful flood beam for work areas within confined hazardous locations. The EPL-22BS-1X150LED-100 portable explosion proof LED light from Larson Electronics provides operators with an easy to maneuver LED work light for use within hazardous locations. 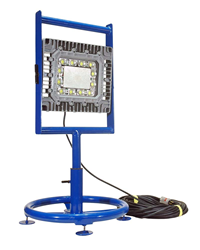 This portable fixture is comprised of a 150 watt LED light head that is mounted atop of a circular base stand that can be easily passed through manways 22” in diameter or larger. The LED light head produces a brilliant flood pattern of light that is ideal for illuminating enclosed areas and hazardous locations where flammable vapors, gases and dusts may be present. The LED lamp head is T5 temperature rated and retains 80% of its lumen output after 60,000 hours of use. The explosion proof LED light head in this unit features multiple LED drivers which help to increase the operational life of the fixture.